The Company Carly Keeps . . .
Carly Fiorina’s Friends, Jesse Jackson, Mahmoud Ahmadinejad, Etc. My friend, Orthodox Rabbi, California-based writer, blogger, and fellow political conservative, Rabbi Dov Fischer, has the disturbing scoop on Ms. Fiorina. He is the head rabbi of Young Israel of Orange County, a Modern Orthodox synagogue, of whose Detroit branch both my grandfathers were co-founders. Rabbi Dov notes a very recent video, posted below, in which Ms. Fiorina details her very friendly, “working” relationship with shakedown artist, anti-Semite, and racist Jesse Jackson, when she welcomed him to his shakedown stop at Hewlett-Packard while she was CEO. Anyone who describes Jackson with the word “gracious,” as she did, is simply brain dead. Rabbi Dov also notes that Ms. Fiorina made a disgustingly pandering speech about Islam, just days after 9/11, in which she described Islam as “the greatest civilization in the world.” That’s funny, since Islam is not great, and it certainly isn’t a civilization. The word “civil” doesn’t actually come to mind at all. And, last but not least, Rabbi Fischer notes that Carly Fiorina sidestepped the U.S. embargo on Iran by using a Middle Eastern subsidiary to sell Iran ink and printers, herself overseeing HP’s “expansion” into Iran. Read Rabbi Fischer’s entire piece. It is well-written and very important. And send it to anyone you know who votes in California. With Republicans like Carly Fiorina and Tom Campbell, who needs Democrats? Rabbi Fischer and I both agree, the only candidate to back in this race, the only true conservative, and the only man who understands Islam, jihad, and the importance of a strong Israel, is Chuck DeVore. Please donate to his campaign. **** UPDATE: Readers RJ and Shy Guy sent me the link to Fiorina’s entire waterfall-gushing speech about Islam, right after 9/11. Read it and vomit (the Islamo-pandering stuff is at the end). NOT PAID FOR BY ANY CANDIDATE OR CANDIDATE COMMITTEE. Oh Golly! Jackson is bad enough, but rabidly pro-Islam too? Carly was a DISASTER for HP, almost running that once fine “Cadillac of printer makers” into the ground. Still feeling the repercussions of her time there, thanks to her having a lot of the programming “outsourced” to non-Americans. I stopped using various HP devices because they became true CLUNKERS on her watch. She’s just another one of these man-wannabe’s who think the only thing she needs to succeed in business is to be a tough “beeyotch”, and to wear manly suits. 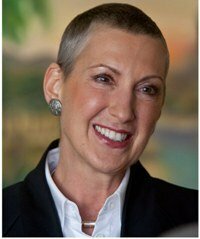 Forgive me if she’s a cancer survivor- but if not, come on, grow some hair- you’re a woman, dammit! It’s clear who these frauds view as their constituencies, and it’s not us. Hopefully if the base doesn’t vote for them, as in Upstate New York, the Republicans will start running at least some more responsive candidates. But I have no doubt the RNC will support Fiorina, as will most, if not all of the talk show hosts and hostesses, It’s just an example of the timeless ‘lesser evil’ approach to politics that has gotten us nowhere. At a time when the Democrats are in disarray politically, we come up with pathetic candidates like Fiorina and Campbell. These mediocrities really need to lose a few primaries and elections. I became a DeVore supporter shortly after he declared for the race. I read up on him and he is truly a Reagan conservative down the line, regardless of issue. Little Al, I think the RNC will go with that political whore Campbell. He makes me vomit in my mouth. This hack is a fox news republican and is always on cnbc. Kudlow wouldn’t give devoure or peter schiff an interview. WOW! I didn’t know Sinead O’Connor and Celine Dion made a baby together! Seriously though, I bought an HP printer some years back expecting that famous HP quality but the piece of crap gave me nothing but greif. I’ve stayed away from HP products since then and am glad I did. Yes, I got an HP laptop in 2005, and it barely was a year old before its chipset and hard drive had problems, which were repaired repeatedly under warranty. I spent the extra money for quality at the time, but there as none to be had. I’m a California Republican and I wouldn’t vote for Campbell or Fiorina. Chuck DeVore will be getting my vote. Little Al, maybe I’m not saying anything new, but it can be rational to vote for a worse party/candidate in one round if this will increase the chance of a much better candidate in the next round. All this hooey about “the lesser of two evils” provides no political incentive for the party machinery ever to produce a non-evil candidate. One can also call this a game of chicken. The party bigwigs say that if you do not support our candidate, or support a third party candidate, the Dems will win! We can say, if you insist on supporting a pro-Muslim, pro-illegal-immigrant candidate, YOU, you “Republican” hack, will LOSE! You see, the Chicken Game has –> TWO <– "equilbria" as they say. Meg Whitman and Carly Fiorina are set to finish what Awwwfuull Arnold did to the state GOP. Chuck DeVore for Senate, Steve Poizner for Governor. The Republicans are falling for two more RINOs. You’d think they would have learned their lesson after Arnold? Debbie, have you seen who’s endorsing Ron Paul? Never mind my post above about Palin and Paul. I was half awake (morning in Jerusalem) when I posted it. I came across Fiorina’s ignorance and coddling of Muslims years ago. This goes back to 2001. Here’s Fiorina’s speech in Minneapolis back then, given just 2 weeks after 9/11. Don’t read the whole thing. Toward the end, look for the paragraph beginning with “There was once a civilization that was the greatest in the world” and read on from there. And here is an Assyrian scholar’s reply to her claims. It’s good to know the facts. I must be the old guy in this group. Does anyone remember how Tom Campbell helped destroy Bruce Herschensohn’s 1992 Senate bid, and California got……..Boxer. Herschensohn was a good man, and pro-life during the NARAL and NOW heydays. Please don’t tell me he is a Muslim sycophant. That would be disappointing. Carly was a disappointment at HP…They kept pushing the “female” executive—she walked away with a wad of $ for the merger-she’s not qualified. Probably another rhino Swartzenegger (kennedy democrat) in sheep’s clothing. Chuck Devore all the way. If you like a Reagan conservative, you need not look any farther than Devore. He’s going to Coakly Carly and then Scott Brown Boxer. I’m certainly no expert on Carly, but I didn’t view her post-9/11 speech as somehow “gushing about Islam” as currently constituted. She harkened back to the day (800-1600) when it was apparently much more tolerant and progressive. President Bush said much the same, and far more. “religion of peace” ??? If anything, the speech might have served to educate current Islam to their much more noble past, in much the same way that many in this country need to be re-educated about our founders and their ideals. It’s certainly unfair to imply that Carly’s somehow “pro-Islam”. That said, I’d much prefer to have Devore in the Senate; just unsure if he’s electable in California. Much of what Carly has to say about business’s role in society in that speech raised some red flags and suspicions. It would be great if we could see, hear or mostly these days read the video! (most of them ore screen scripts) however it is information no one is able to access……now is not the time to be covert!